Welcome to our third regular issue of The eBullet for 2012! This issue was originally scheduled for May, but with the sad deaths of George Lindsey and Doug Dillard that month, we postponed this regular issue and published a Special Edition eBullet for both George and Doug. Subscribers should have received those by e-mail in May and early June. They're also in our eBullet Archives online. The Andy Griffith Museum, featuring Emmett Forrest's amazing collection of Andy Griffith memorabilia, is open daily in Mount Airy, N.C. For info, visit the website at www.andygriffithmuseum.org/ or call (336) 786-1604. 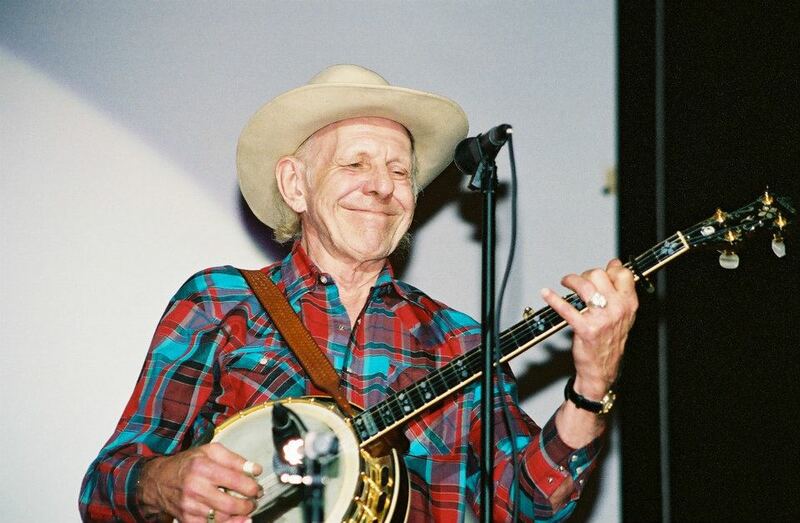 * June 23: Dean Webb and Missouri Boatride perform at the Kimberling City Summer Bluegrass Concert Series at Kimberling City Shopping Mall, outside of Hillbilly Bowl, from 7 to 9 p.m. Admission is free but bring something to sit on (or else some Miracle Salve for the next day). * June 30: POSTPONED UNTIL SPRING 2013. 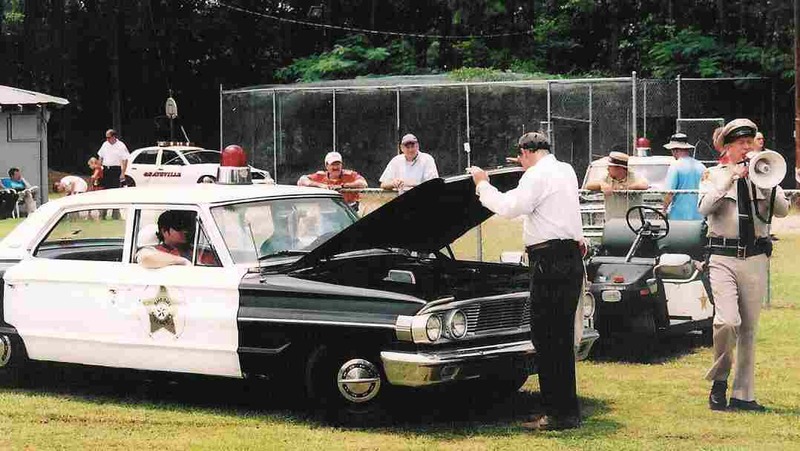 The 12th Annual Mayberry Squad Car Nationals is relocating to Pelham, Ala. Officials with MASCAR (Mayberry Authentic Squad Cars and Racing) apparently received pressure from a worried NASCAR that Talladega Superspeedway felt threatened by the new closer location of the prestigious Mayberry Squad Car Nationals and therefore pleaded for more time to brace for the competition from the vintage patrol car crowd-pleasers. At least that's the rumor we're trying to get started (just like Joel Laird's squad car). Stay tuned for details about exactly when and where the Nationals will roar next spring. 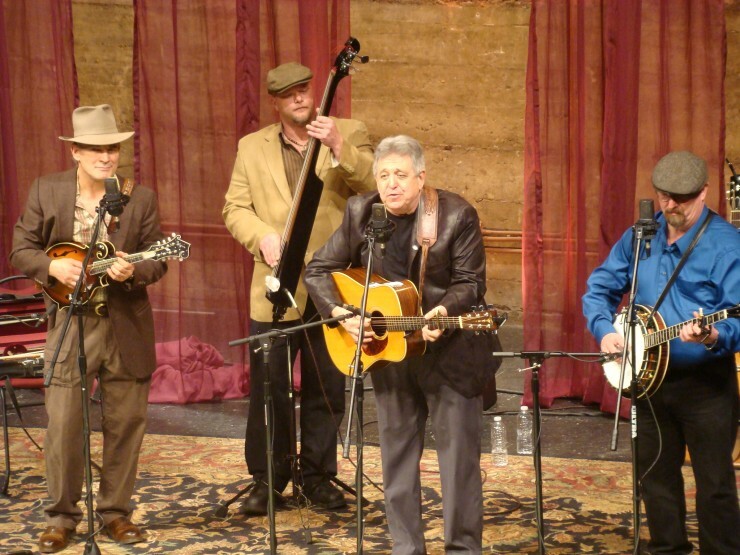 * July 7: Dean Webb and Missouri Boatride perform at the Kimberling City Summer Bluegrass Concert Series at Kimberling City Shopping Mall, outside of Hillbilly Bowl, from 7 to 9 p.m. The music is free, but bring your lawn chair. * July 13: David Browning spins yarns at the Bristol (Va.) White Sox game. 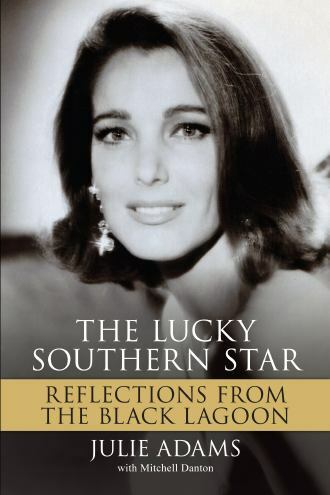 * July 11-14: Julie Adams appears at the Western Film Fair in Winston-Salem, N.C. (Nancy Stafford of "Matlock" is also among the stars with an Andy Griffith connection attending.) For more info, visit http://westernfilmfair.tripod.com. * July 14: Neal Brower gives the latest lecture in his series about "The Andy Griffith Show" at 2 p.m. at the Andy Griffith Museum in Mount Airy, N.C. This month's lecture is about the episode "Mr. McBeevee." Ask Neal if he can make smoke come out of his ears. (Actually, asking the question might make it happen!) The lecture will be held in the lower level of the museum. Please call (336) 786-7998 for info about reservations for large groups. Reservations for small groups or individuals are not required. Admission to the lecture is $10 per person and includes the Andy Griffith Museum, Siamese Twins Exhibit, and Old-Time Music Heritage Hall at the Earle Theatre. Hail to thee, Miss Mayberry! Photo by Hobart Jones. * July 20: Betty Lynn (Thelma Lou) greets fans at the Andy Griffith Museum 12:30-3:30 p.m. She will have autographed 8x10 photos available ($10). * July 21: Dean Webb and Missouri Boatride perform at the Kimberling City Summer Bluegrass Concert Series Kimberling City Shopping Mall, outside of Hillbilly Bowl, from 7 to 9 p.m. Got time to breathe, got time to music. * July 25-29: Ronnie Schell performs at The Improv at Harvey's in Lake Tahoe. * July 28: Premiere (black tie optional) of Return of the Killer Shrews, featuring James Best, David Browning, and other cast and crew (including Rick Hurst, Jennifer Lyons, Jason Scott and maybe John Schneider), in Bristol, Tenn. Tickets are $100 for benefit of Speedway Children's Charities. For tickets and details, visit: https://www.xorbia.com/e/foundation/returnofthekillershrews. It's sure to be a Shrew-reel experience! * Aug. 2: You'll be doubled-over with laughter with David Browning at the Elizabethton (Tenn.) Twins game. * Aug. 4: Dean Webb and Missouri Boatride perform at the Kimberling City Summer Bluegrass Concert Series at Kimberling City Shopping Mall, outside of Hillbilly Bowl, from 7 to 9 p.m. Got time to breathe, got time to music. * Aug. 5: Rodney Dillard and the Dillard Band and David Browning celebrate Mayberry Sunday at 8 p.m. at Fountain of Life Bible Church in Johnson City, Tenn. Admission is free. For more info, call (423) 282-0655. * Aug. 10: David Browning has his citation book ready for the Appalachian Antique Auto Club of American Downtown Hot Bristol Night Cruise-In in Bristol, Tenn./Va. * Aug. 11: Neal Brower gives the latest lecture in his series about "The Andy Griffith Show" at 2 p.m. at the Andy Griffith Museum in Mount Airy, N.C. This month's lecture is about "Prisoner of Love," a jewel of an episode that can steal hearts. The lecture will be held in the lower level of the museum. Please call (336) 786-7998 for info about reservations for large groups. Reservations for small groups or individuals are not required. Admission to the lecture is $10 per person and includes the Andy Griffith Museum, Siamese Twins Exhibit, and Old-Time Music Heritage Hall at the Earle Theatre. 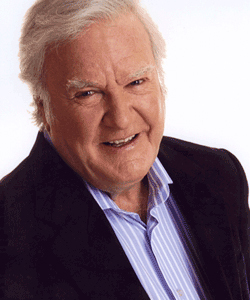 * Aug. 11 and 12: James Best is joined by fellow "Dukes of Hazzard" stars and David Browning at the Hazzard Homecoming in Sperryville, Va. For tickets and info visit http://www.cootersplace.com/hazzard-homecoming/. 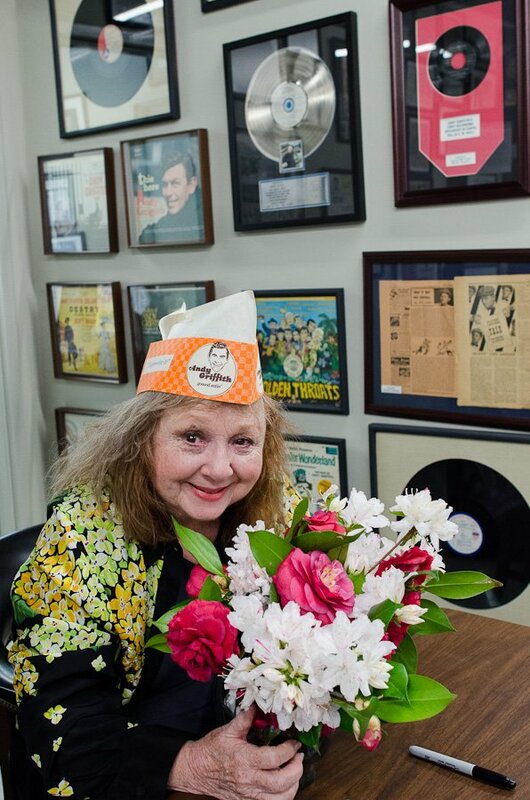 * Aug. 17: Betty Lynn (Thelma Lou) greets fans at the Andy Griffith Museum 12:30-3:30 p.m. She will have autographed 8x10 photos available ($10). * Aug. 18: Dean Webb and Missouri Boatride--See and ditto Aug. 4. * Aug. 18: We'll be darned! David Browning is at the Salem (Va.) Red Sox game. Rodney Dillard and the Dillard Band. Photo by Tim White. * Aug. 24 and 25: Rodney Dillard and Maggie Peterson are joined by several of the Mayberry tribute artists (including David "Mayberry Deputy" Browning, Allan "Floyd" Newsome and Jeff "Howard" Branch) for a Cruise-In on Fri. and then concert benefiting the Montgomery County DARE program on Sat. The evening concert will be at the James H. Garner Center in Troy, N.C. Tickets are $20 for reserved seats and $15 for general admission. Tickets for children 6 years-12 years old are $10. For more info, call Jeff Branch at (704) 985-6987, e-mail jbranch205@windstream.net, or visit www.bluegrassintroy.com/. * Sept. 1: "Surprise, surprise, I can see it in your eyes." 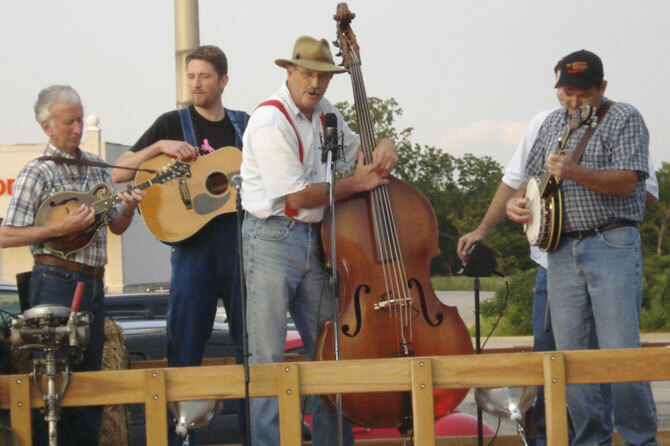 Dean Webb and Missouri Boatride perform at the Kimberling City Summer Bluegrass Concert Series at Kimberling City Shopping Mall, outside of Hillbilly Bowl, from 7 to 9 p.m. The music is still free, but bring your chair, blanket, cushion, bench, or tree stump to sit on. * Sept. 5: It's a big 10-4 that David "Mayberry Deputy"Browning, Allan "Floyd" Newsome, and Kenneth "Otis" Junkin will be to the rescue for the 911 Festival Celebration in Haleyville, Ala.
* Sept. 7 and 8: David Browning tows the line at Tom Johnson Camping Center's Fall Barbecue in Marion, N.C.
* Sept 15: Dean Webb and Missouri Boatride wrap up their 2012 Kimberling City Summer Bluegrass Concert Series at Kimberling City Shopping Mall, outside of Hillbilly Bowl, from 7 to 9 p.m. Got time to breathe, got time to music. * Sept. 27-30: 23rd Annual Mayberry Days in Mount Airy, N.C. Stars confirmed so far are Betty Lynn (Thelma Lou), Dean Webb (mandolin-playing Darlings boy), Maggie Peterson (Charlene Darling Wash), James Best (Jim Lindsey) for Thurs. 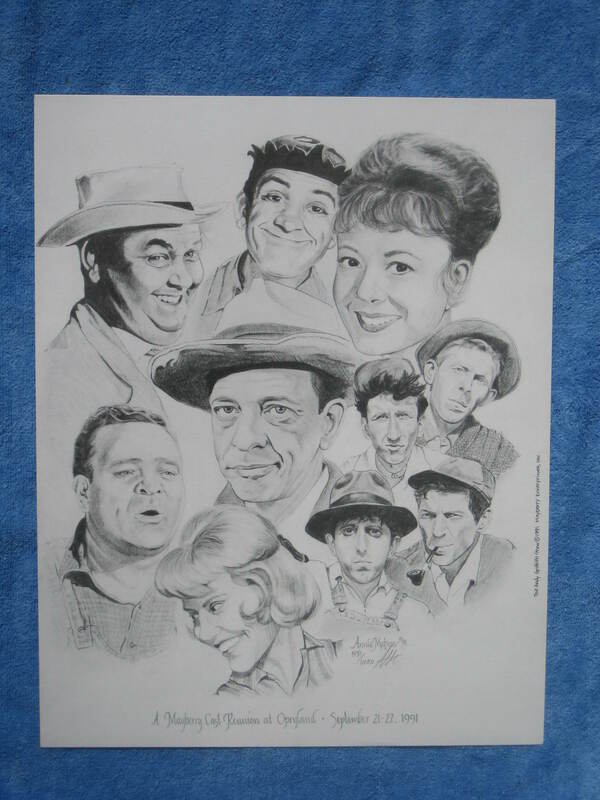 and Fri. only, Jackie Joseph (Romeena), LeRoy McNees (of the Country Boys), George Spence (Frank the Fiancé), Karen Knotts (daughter of Don Knotts) and George Lindsey Jr. (son of, well, obviously). 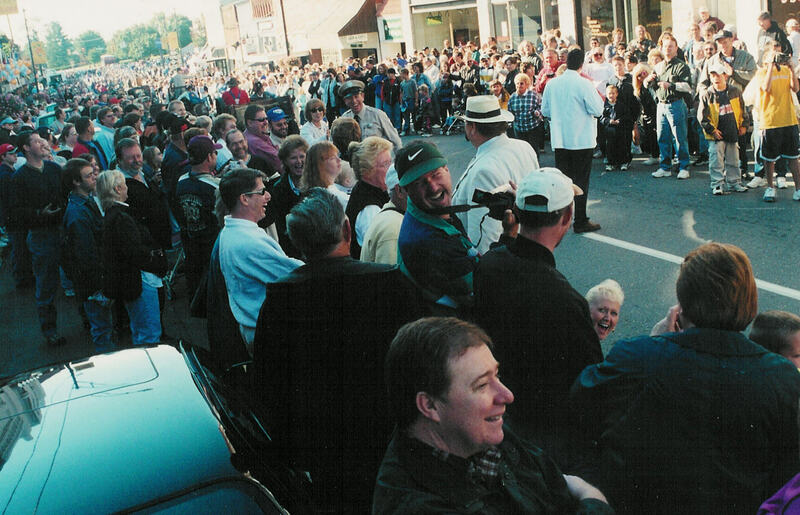 With the sad passing on May 16 of Doug Dillard, the only performer to participate in all 22 previous Mayberry Days festivals, there's a huge hole in the heart of the festival. Doug and his memory will be honored at this year's festival. Further details and more stars TBA. Tickets are now available to order for several parts of the festival. (And it's already not too early to book a hotel room.) 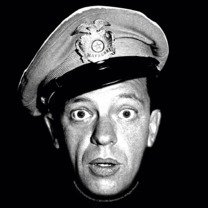 For updates, visit www.mayberrydays.org. It's big!!! * Oct. 1: James Best is featured at an All-Star Concert at the Marriott Baton Rouge Hotel in Baton Rouge, La., with country stars Clay Walker and Tracy Lawrence. Sonny Shroyer from "The Dukes of Hazzard" will also appear. * Nov. 30: Rodney Dillard and the Dillard Band perform at 7 p.m. at Grace Fellowship Church in West Palm Beach, Fla. David Browning also appears. Tickets are $12. For more info, call (561) 333-4222, Ext. 232. * Feb. 9: Rodney Dillard and the Dillard Band perform at the Historic Jonesborough Bluegrass Series at 7 p.m. at the Historic Jonesborough Visitor Center Auditorium. Tickets are $20 for adults and $10 for kids under 12. For more info, visit http://www.jonesboroughbluegrass.com/. NANCY © 2012 Gilchrist. Reprinted by permission of Universal Uclick for UFS. All rights reserved. Andy Griffith is doing fine at his coastal home in North Carolina. Jim Nabors is recovering well from heart surgery in Hawaii on May 29. Unable to be at the Indy 500 in person to sing "Back Home Again in Indiana," Jim made a recording that was played on the PA before the race. Here's a link to a May interview with Jim. Here's a photo Ron recently tweeted while working on Rush. He said he likes to sit on this apple crate while editing. Ron Howard has completed principal filming in England for the Formula 1 racing movie Rush, his latest film as director. 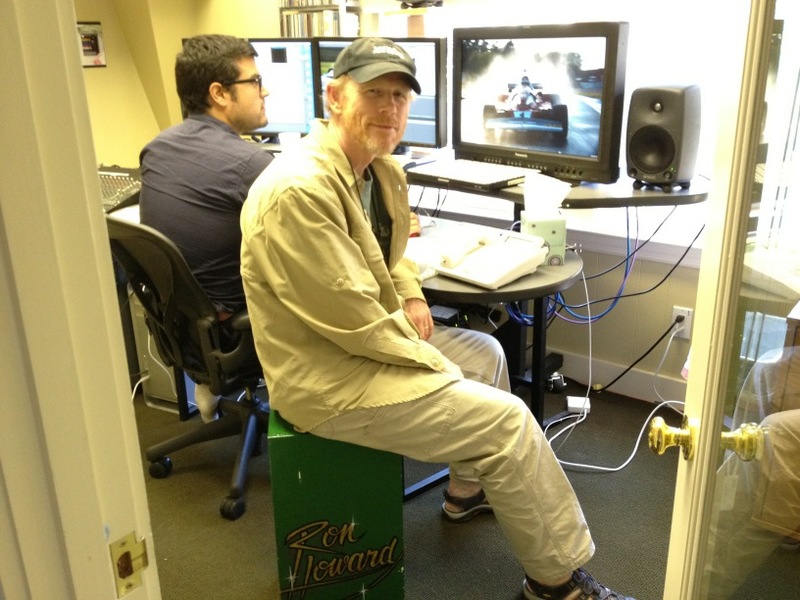 Ron is fun to follow on Twitter (@RealRonHoward), and he has tweeted a lot during the production of Rush. Ron also is partnering with Canon USA for a second year in a photo contest. The theme of this year's contest is Long Live Imagination. Learn more about Project Imagin8ion at YouTube.com/Imagination. The TV production arm of Ron's Imagine Entertainment is involved in the summer reality show "The Great Escape" for TNT. And it's producing "How to Live with Your Parents for the Rest of Your Life" for ABC this fall, as well as another season of "Parenthood" for NBC. Rance Howard plays a train engineer in The Lone Ranger, now filming. And he was in an April "Grey's Anatomy" episode. He and Clint also recently filmed an episode of Showtime's "Huff." Betty Lynn continues to greet fans monthly at the Andy Griffith Museum. She also participated in a North Carolina USO reunion and fundraiser in April. Maggie Peterson was a guest for the Cherry Blossom Festival in Marshfield, Mo., in April. She is doing some Mayberry events this year--including April's Mayberry Comes to Westminster (S.C.)--with TV brother Rodney Dillard, and she performs regularly at the world famous Bootlegger Bistro in Las Vegas with husband Gus Mancuso. 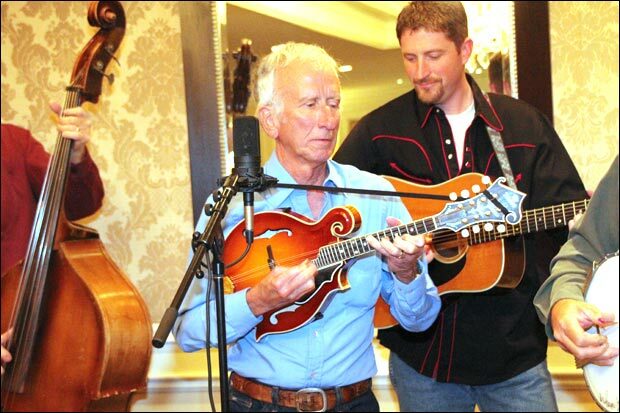 Dean Webb is featured in a nice profile by Bill Graham in the Mandolin Café blog. James Best is in Romania this month filming Confections of a Discarded Woman, a movie written and produced by daughter Janeen and her husband, Michael Damian. James has also been painting a lot and making some "Dukes" personal appearances. 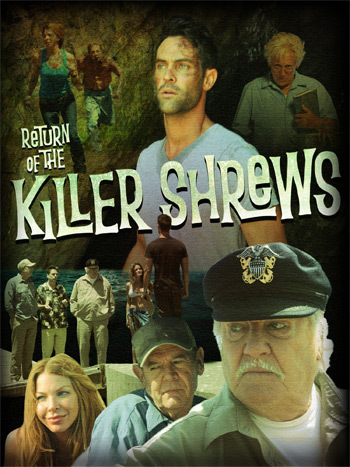 And beware...his Return of the Killer Shrews is about to gnaw its way into theaters, including a special fundraiser premiere in Bristol, Tenn., on July 28. Here's the link the Shrews Premiere website. Amid work on her memoir, Margaret Kerry (two characters in two episodes) is speaking about her Disney experiences at the Ronald Reagan Presidential Library in July. Ronnie Schell was a huge hit at the Eagles' Wings fundraiser in Tuscaloosa, Ala., in April. We're sad to report the passing of two performers who appeared on TAGS. 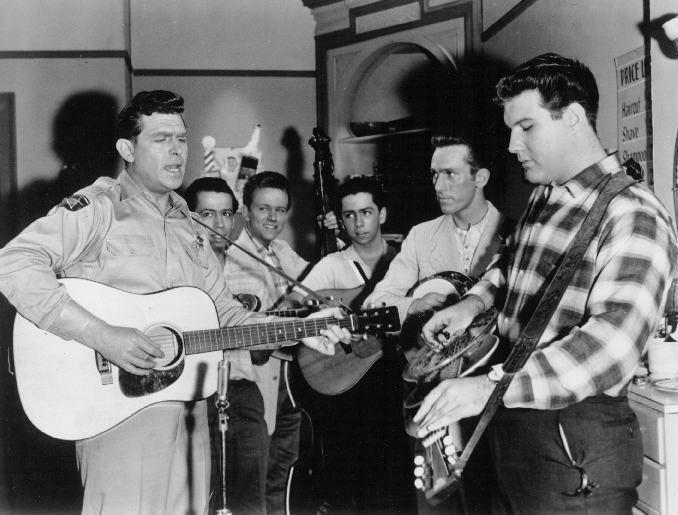 Andy Griffith with The Country Boys (l-r) Roland White, Eric White, Clarence White, Billy Ray Latham and LeRoy McNees. Eric left The Country Boys in 1961, right before they became more famous as The Kentucky Colonels and before Clarence went on to become the guitar-playing legend in The Byrds. Among Eric's survivors are brother, fellow Country Boy and renowned mandolin player Roland White of Nashville. 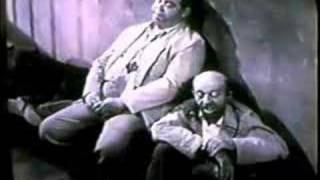 Cellmates Otis (Hal Smith) and Luke (Frank Cady). Frank Cady, who played town drunk Will Hoople in the "Danny Meets Andy Griffith" pilot for TAGS and also Mount Pilot-based drunk Luke in "The Rehabilitation of Otis," Episode 145, died on June 8 at his home in Wilsonville, Ore. He was 96. 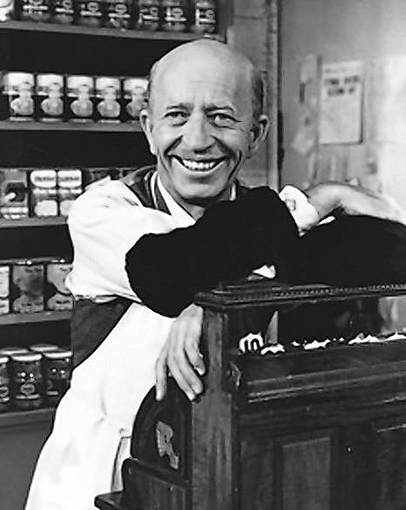 Frank Cady as Sam Drucker. Frank Cady is survived by a daughter, Catherine Turk; a son, Steven; three grandchildren; and three great-grandchildren. Shirley, his wife of 68 years, died in 2008. Here's a link to his obituary in The New York Times. Old Aunt Maria's Café Moss Point, Miss. "Where Did You Hide the Liquor, Otis?" Southport, N.C.
We now have had 1,392 chapters founded since TAGSRWC started in 1979. If you're interested in starting a chapter of TAGSRWC, all you need to do is choose a name that hasn't already been picked, and submit it with a list of your founding members by e-mail to Goober@imayberry.com or by U.S. mail to TAGSRWC's HQ in Nashville. There's a searchable list of existing chapter names at www.tagsrwc.com. Once you successfully choose a name that's all yours and nobody else's, you'll receive your Official Chapter Charter, fancily inscribed (and "suitable for framing" by Sherry Hyatt, one of our Compelsion Nuts chapter in East Tennessee. We're really excited about the launch this year of a wonderful Web activity hosted by TAGSRWC and organized and overseen by webmaster Allan "Floyd" Newsome. 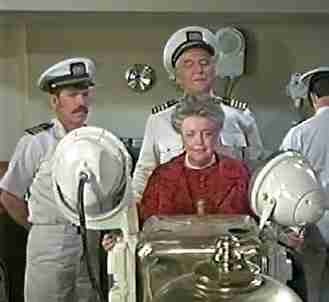 It's called iMayberry Community. You can check it out and sign up for free at: http://imayberrycommunity.com/. Two Chairs, No Waiting is our weekly podcast of TAGS has news, interviews and pretty much whatever happens to be going on in and around Mayberry. It's hosted by our Allan Newsome. There's a new episode every Tuesday (and you can watch and listen live during tapings on Monday evenings). Past episodes are in an online Archives in case you want to listen to episodes you've missed. (There have been over 190 episodes since 2008!) Especially good recent episodes featured tributes to George Lindsey (including commentaries from George) and Doug Dillard. And there'a Brother Figure podcast to Two Chairs, No Waiting. It's hosted by longtime TAGSRWC member Kevin Burke, who does a great job of describing and discussing individual episodes. It's called Burke on Mayberry. Check it out. TAGSRWC's official page on Facebook now has more than 11,000 friends! You can find us at www.facebook.com/tagsrwc. There's a variety of comments about Mayberry, and a lively stream of fans' favorite TAGS lines. And our Facebook page is also one of the first places we post announcements and breaking news about TAGS. If you haven't already dropped by the page, we hope you'll check it out sometime when you have the chance. We invite you to become a TAGSRWC Facebook Friend! A few of those who gathered for the "Shakedown! Shakedown!" cookout in May. "Shakedown! Shakedown!" 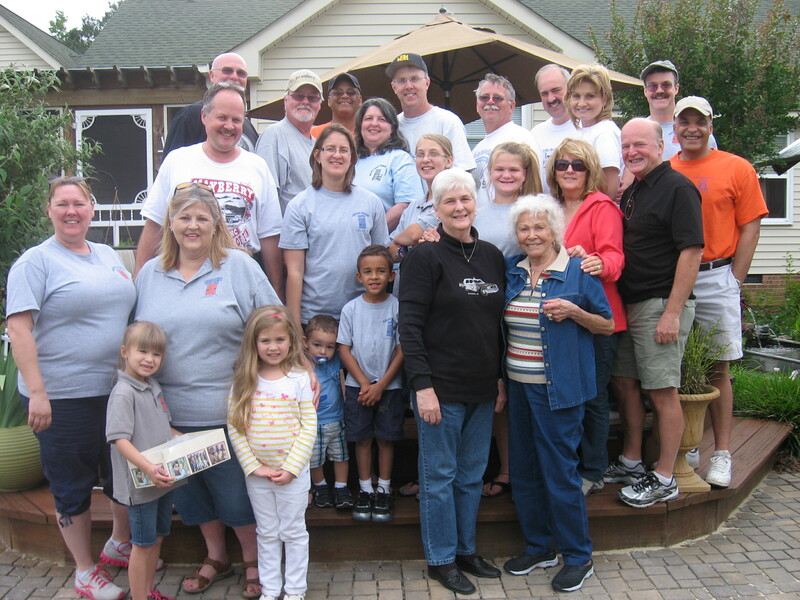 chapter (Laurinburg, N.C.) had a cookout in May with 25 members and guests. Members of Wally's Front Porch (Wilson, N.C.) and from as far away as Tennessee were in attendance. 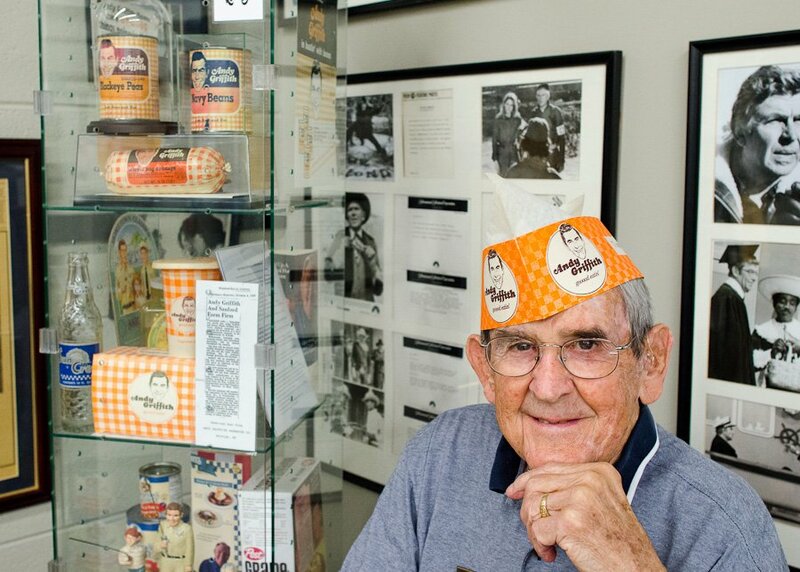 Chapter leader Dewey Lamb reports that they had "'dogs, burgers, baked beans, 'nanner puddin', peach cobbler, and a churn each of strawberry and vanilla ice cream. Yum!" To which we add our own "Yum!" Those gathered played trivia and several lawn games. The consensus was that the meeting was their best get-together yet. 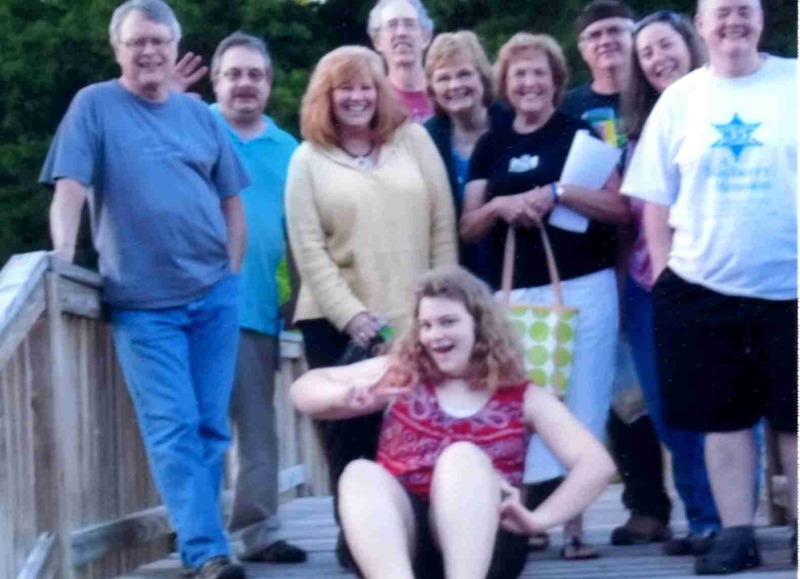 Mayberry chapter (Knoxville, Tenn.) has been busy not only with monthly chapter meetings and activities and attending various events, but the June edition of their nice thrice-a-year Mayberry Minutes newsletter is just out. It's a whopping 18 pages with lots of color photos. (You may have read some of the stories and seen some of the photos before in issues of The eBullet, but there's a lot of new stuff, too. 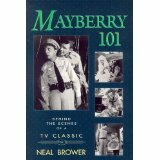 And besides, we like Mayberry reruns!) 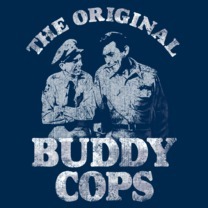 And check out their chapter website at www.mayberrychapter.com. 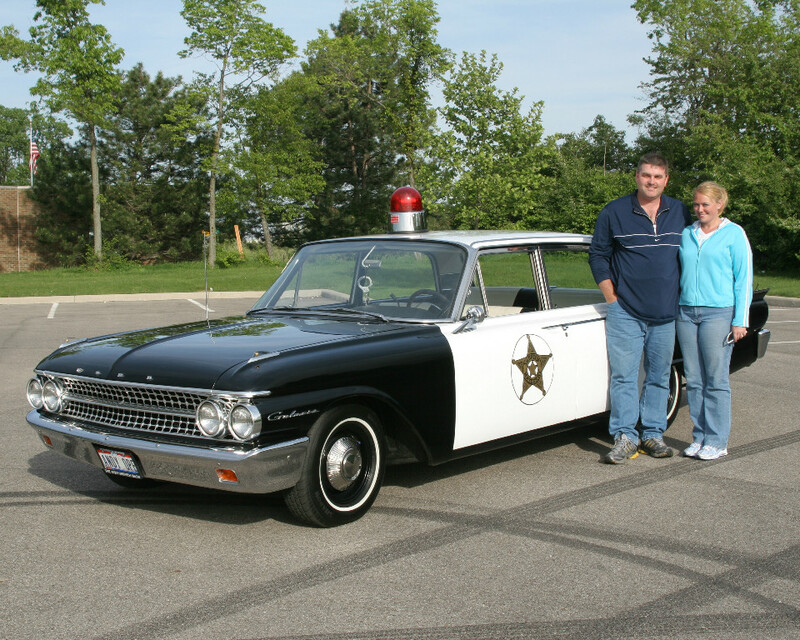 Here's a link to a video and interview by the Dayton Daily News with TAGSRWC member Tony Farley of Springfield, Ohio, and his Mayberry squad car replica. Along with restocking our shelves with most of our perennial favorites, we have added several brand new items, and also have new offerings of some rare vintage merchandise and memorabilia. Here are three new officially licensed T-shirts that have come out this year. These are the newest of more than 30 T-shirt designs you can find online at Weaver's. 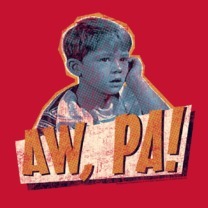 Get your new shirt and be assured of being Mayberry Cool all summer long! And here's a couple of vintage (20 years and older) licensed items that we've added this year. 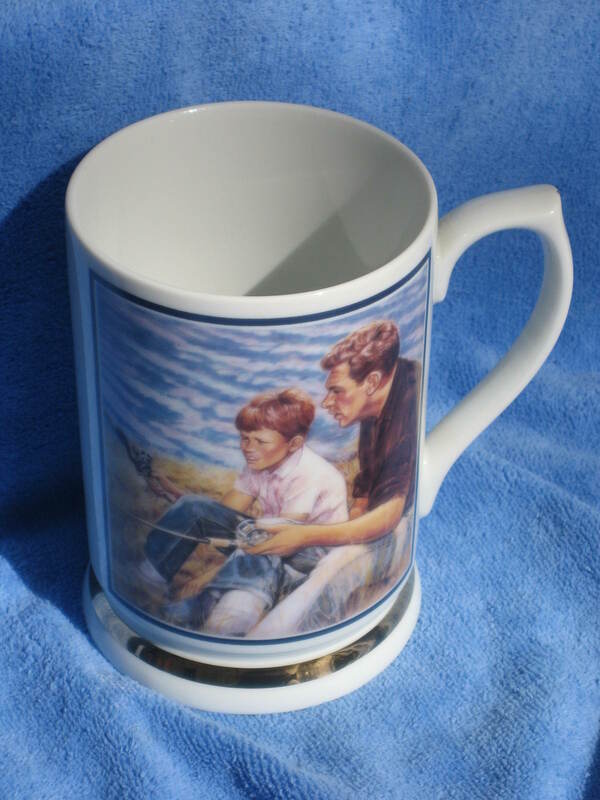 On the left is an Ernst & Co. ceramic mug from 1990, and, on the right, is a Limited Edition print from the Mayberry Cast Reunion at Opryland in 1991. They're in the Collectibles & Special Items section of Weaver's. Got the Summer Boredom Blues? Need something to supercharge a bored summer? 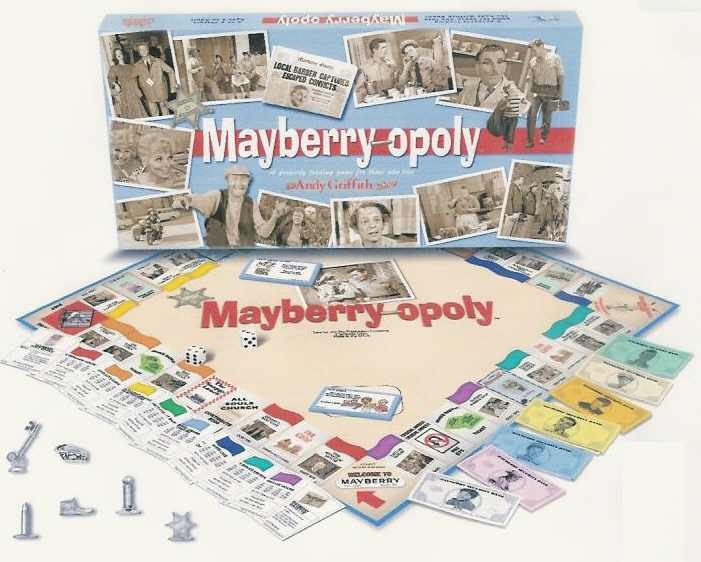 Well, Weaver's has just the cure--a nice game of Mayberry-opoly. Change from your family's bored game to a really fun family board game! The next issue of The eBullet is scheduled for August, and the next Weaver's Newsletter is planned for July. Till then, happy Mayberry watching!